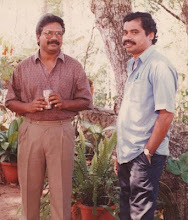 Sreebala K Menon, associate of Bhagyadevatha came up with a feel good movie, which is getting good reports all over.. It is not a surprise for anyone who knows about Sreebala, a talented director who had taken some documentaries before.."19 Kanal road" and "Silvia Plathinte Master piece" were the main books written by Sreebala before.. Requesting all viewers to watch the movie and support the talented director Sreebala K Menon.